My 7 yr old refused to pose for me with his new pants on even though he really loves them. I am not going to force him to pose my blog, I am o.k . with that. This time. LOL. So here they are. They are pretty simple, but that’s the plan, to just keep it simple, and get them done, one right after another. 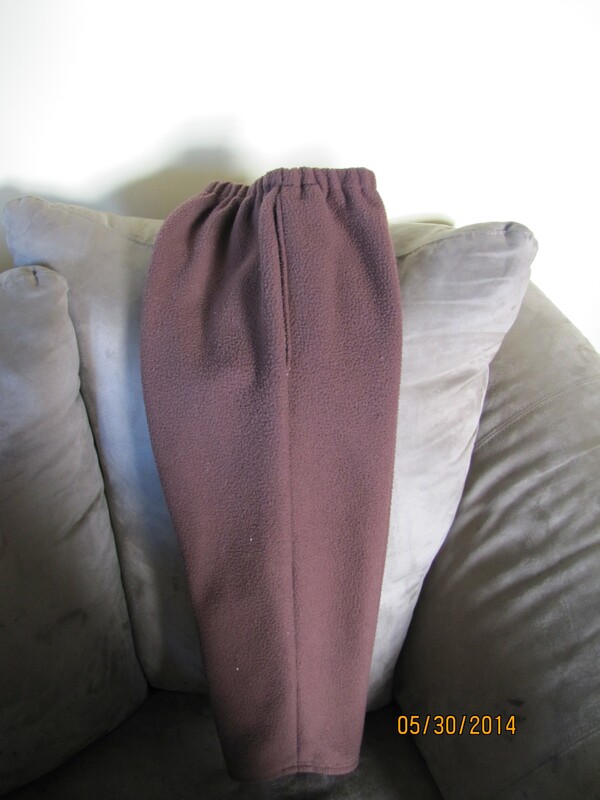 These pants are made from a heavy brown polar fleece. 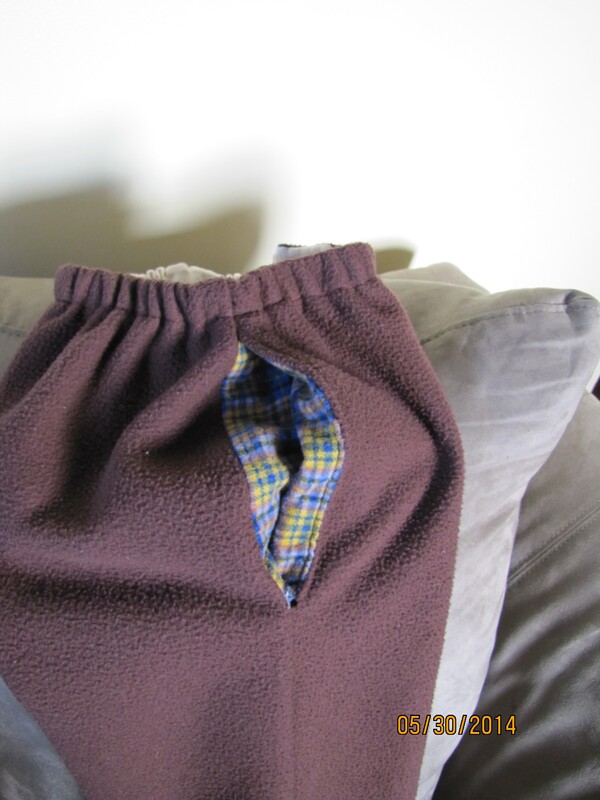 My boys love polar fleece so I started with that because I needed the chance of the kid liking the home made pants to be high. 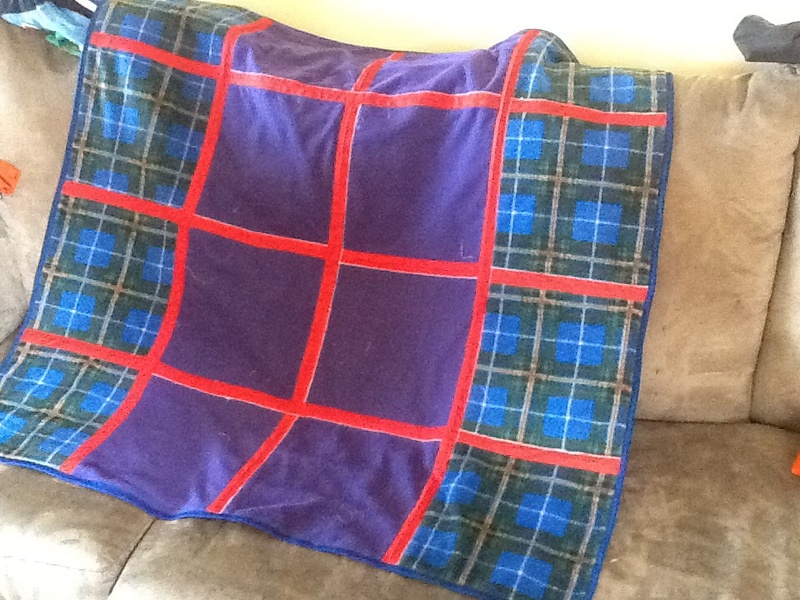 Because the fabric is very heavy, and I wanted the pockets in the side seams to lay flat, I chose to use a contrasting thin fabric, in this case, a scrap of plaid flannel. It was important to me that he put them on forward, as there is no fly, or rear seat pockets so I added a button so he would know what side was front. This also helps to keep the pockets flat, if he doesn’t put his pants on backwards. Again I used a different fabric(bias tape) for the waistband, because I was worried about how think a waistband made from several layers of polar fleece would lay against his skin and bone structure. My 7 year old is SO skinny, that’s 90% of why I am sewing pants from scratch to begin with. It is an elastic waistband all the way around. He says the waistband is a perfect fit, not too tight, not falling off. This is a picture of the top stitching on the pocket opening because I am very proud of it and then how the tops stitched side pocket fit into the side seam. The pants ended up being almost too short. I did a very narrow hem with two rows of top stitching. You can see from the bum in this picture, that these pants are actually quite wide too. Next pair for this kid I am going to narrow the entire leg pieces for a better fit for his skinny self. I have a lot of fabric. That is an understatement. I have no where to store most of it properly at the moment. And I am 7 months pregnant with my 4th child. I already gave away a lot of my fabric once in my life, when I believed I had replaced sewing with scrap booking as a hobby. Then I started working at the fabric store again, and at first I was very very good. All my pay cheques went to gas, cell phone, and paying down the VISA. And then, of course, a few months in, I cracked. The hoarding due to ridiculously good deals began anew. So, at the moment, the fabric situation in the basement laundry room area is pretty much knee deep. Even if that IS an exaggeration, I can’t actually see the floor. Anywhere there. The best part is that my Mother In Law arrives in about 8 weeks to help with the new baby. All I have to do is look around the laundry room and I can feel the anxiety mounting. She doesn’t understand this part of me AT ALL. My husband doesn’t either, but he has a den all to himself, so he leaves me alone about the hoarding in the basement situation for the most part. I have three boys, and myself to clothe. In the last year or so, two out of three of my boys have gotten very very picky over PANTS. Issues abound every morning when attempting to get them dressed for school, issues of comfort, issues of too loose, too tight. Too short. Too long. So,here we go. 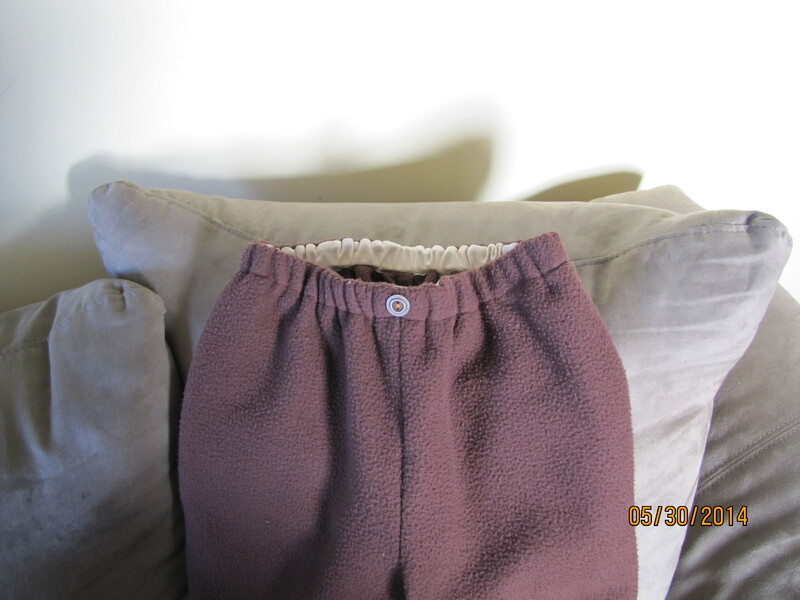 Pants, especially sporty type pants with elastic waistbands, are NOT particularly difficult to sew…. I could fit them at each step of the way, for length, for too wide, for too long in the waist to crotch seam. I can make each waistband (elastic) exactly the right tightness. Next, my brilliantly creative, (and OCD) mind came up with a plan to evolve hoards of fabric into useful pants for small, medium and large boys, and me too. Won’t this make my husband and my Mother In Law happy? They will actually be able to see process into the cleaning up of the basement mess. Monday – cut out pants pattern. Tuesday – sew on all pockets. Wednesday – sew main side seam and crotch seams. Thursday – waistband. Friday – hem. In this way, I would produce a new pair of pants, whether they are simple dress pants, track pants, or jammie pants, every single week. A new piece of fabric gone from my stash every single week. And, at this “easy -few -steps -a -day” rate, I should be able to sew for about an hour, while kids are in school, and hubby is at work, and STILL get lots of housework done! Especially since I have discovered that sewing in the mornings after my cup of coffee energizes me to get going and get things done. I was SEW excited! What could go wrong? Well, the FIRST week the pants went together like a house on fire…sigh. Stay tuned for more photos and updates. I would really like it if I could never see this blankie again. It just fought me every single step of construction the whole way. I learned so much though. 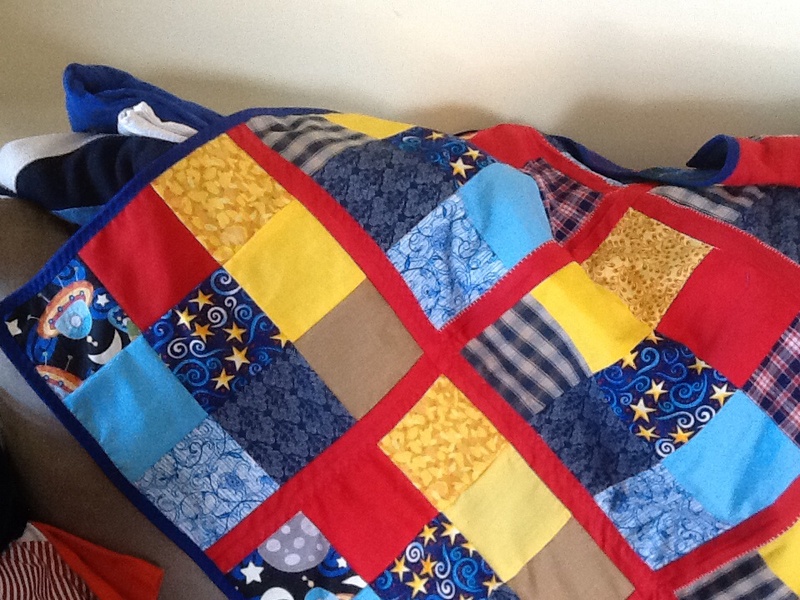 I promised this quilt mini as it is now to my middle son. 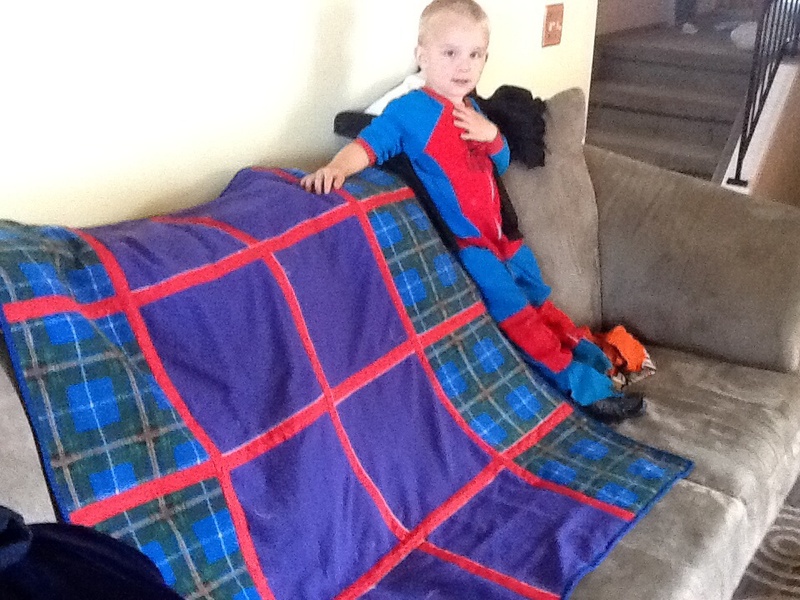 It was originally supposed to be big enough for his twin bed but I ran out of too many of the original fabrics to go on. So I just finished it off and it’s a done project now. 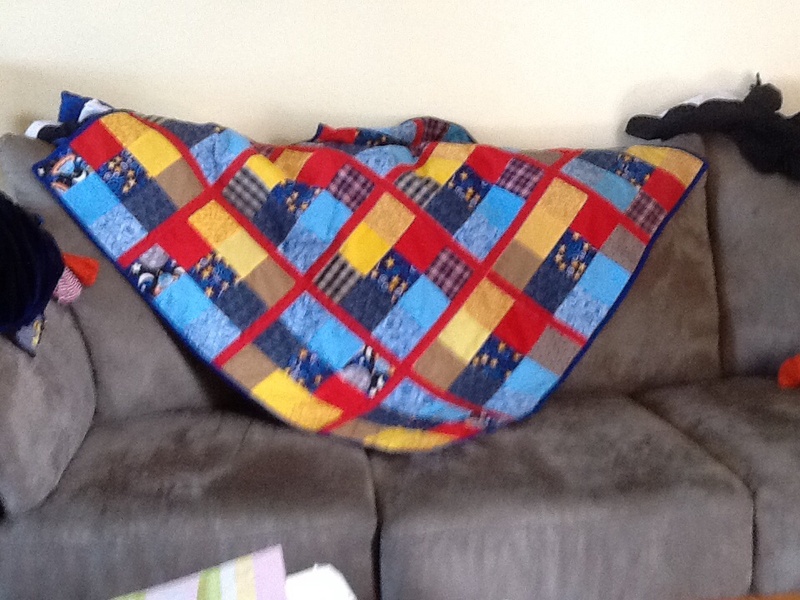 I could have thrown it out a long time ago I guess, but patchwork squares is so much work, I was too head strong to quit. I was trying to choose a pattern that was very masculine, something outside my comfort zone, and I will never do that again. I will stick with colours and fabrics that “feel” right. Isn’t that what sewing is all about anyway? This project was incredibly disappointing to me personally. I learned so much as I worked on this ugly little thing…I am too stubborn to quit working on it, but I am tired of each step not working. But I learned lots. 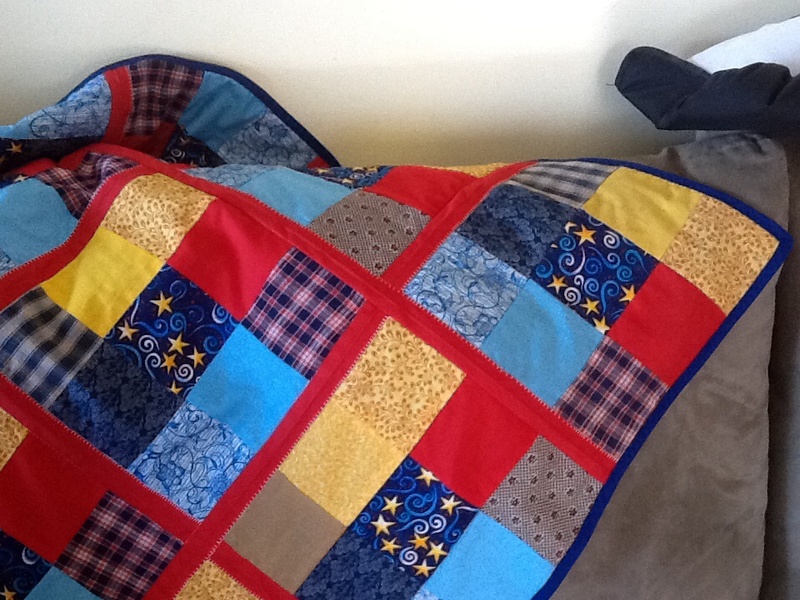 I was so proud of myself when I first discovered this method of patchwork construction, and my first project, was beautiful, and I gifted it to my mother in law. I have decided that 3 x 3 pattern is too small, there is too much bias tape involved then. 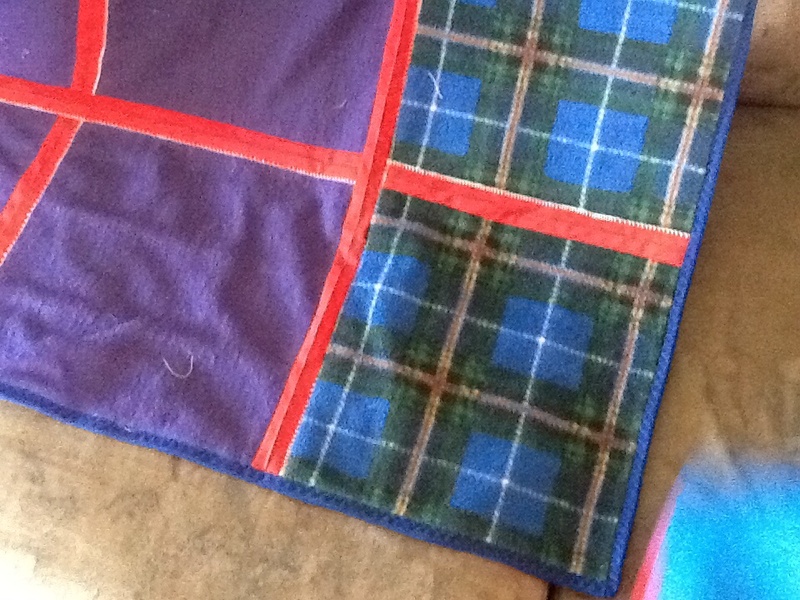 If I do a 3 x 3 pattern again, I will join 4 squares of 3×3 first before joining them to the backing. 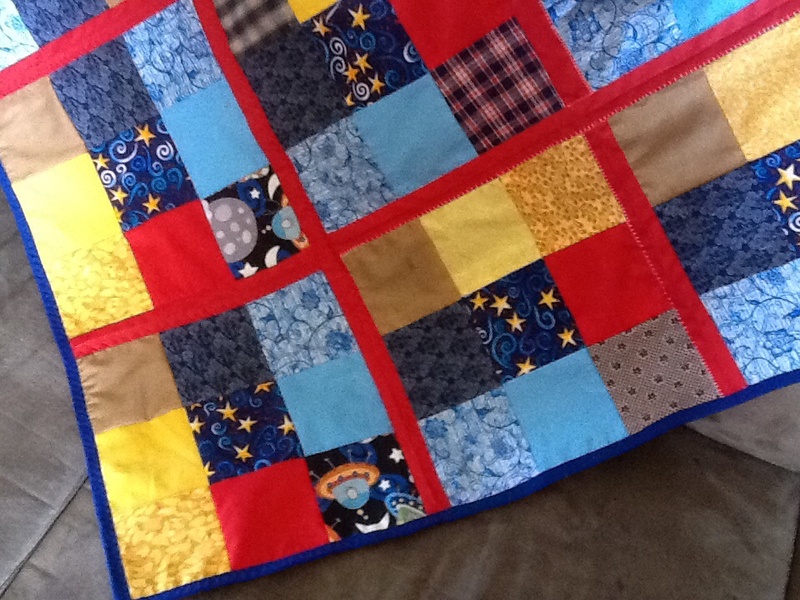 Also, to, I stitched most of the top stitching in a contrasting color because I thought it would be “cool”. Well, it wasn’t cool. It looks terrible on the back. So in the end I switched to a matching thread for the top stitching. I ran out of one of at least two of the fabrics in the process. This was supposed to be big enough for a twin bed, but I got to this point, and realized I had run out of three MORE of the fabrics. So I got the bee in my bonnet to just finish of the edges. I will soon post pics.